1How does one write about a friend? I have known Michel for almost forty years and though I don't think I can be “objective,” I can perhaps tell a little about our relationship. 3Michel was further along in his work than I, but we did pool together whatever we knew about Wright and promised to inform each other about any new material we could find. Michel had undertaken a far more ambitious project than mine. I would begin a critical study, but he would write a biography —which I thought madness at the time. It would take ages, I said, and what would make it even more problematic is that a European would be required to try to understand the mad tangles of American culture, especially as regards race. Would American whites and blacks respond to him as easily or openly as the French might if he were writing the life of a French artist? 4However, Michel was confident, though I was also struck by his humor and irreverence. Of course he would do the most thorough job that he could, but he also knew that academia contained a lot of stuffed shirts, and perhaps what he would write might shock them into an awareness of important cultural forces under their very noses. And I believe this, among other things, is what Michel has succeeded in doing and by so doing has immeasurably helped broaden the university curriculum and intellectual environment both in America and France. 5Although Michel and I have both necessarily gone our separate ways, we have from time to time come together for various projects: among them the first extended bibliography of Wright's works, collections of Wright's letters, and of course lately a biography of Chester Himes. I need not add here how conscientious and prolific a scholar in other areas of American and African-American literature Michel has always been, but I should also like to inject a more personal note. As our work and interests coincided, we came to know each other more and more as friends. When Michel and his wife, Geneviève (also a fine scholar), and on one occasion his children, were in America, they would often stay at our apartment in New York; likewise my trips to France often included a stay at their home in Paris. The year I taught in Paris, Michel —however hard-pressed— was always generous with his time and assistance. On other occasions we would get together on Cape Cod or in Vermont. And only recently my wife and I joined Michel and Geneviève on an automobile journey along the Carolina and Georgia coasts. But whether at work or at leisure, I was constantly made aware of his limitless intellectual curiosity and energy. 6There was very little about American culture or history or literature he would not inquire about, and of course he was a voracious reader who would plunge into books of any kind that might be lying around the house. But beyond all that there is his genuine selflessness in whatever help he can give to students and scholars alike, not only in Europe but on visits to universities and small colleges in the American South. I have also observed him going out of his way to befriend struggling authors. What I know of Michel is that even in retirement, he has been giving more of himself than those among us who are still fully engaged. MARGOLIES, Edward. 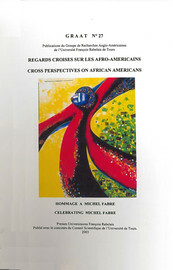 A Tribute to a Colleague In : Regards croisés sur les Afro-Américains : Mélange en l'honneur de Michel Fabre [en ligne]. Tours : Presses universitaires François-Rabelais, 2003 (généré le 21 avril 2019). Disponible sur Internet : <http://books.openedition.org/pufr/4178>. ISBN : 9782869064690. DOI : 10.4000/books.pufr.4178. Margolies, Edward. “A Tribute to a Colleague”. Julien, Claude. Regards croisés sur les Afro-Américains : Mélange en l'honneur de Michel Fabre. Tours : Presses universitaires François-Rabelais, 2003. (pp. 155-156) Web. <http://books.openedition.org/pufr/4178>.